WASHINGTON — One of President Donald Trump's strengths as a political figure has been his approach to combat — to his supporters, that makes him authentic. But in now the predictability of his strategy, tactics and messaging have become an Achilles' heel in the nation's capital. At times, he seems like a boxer who only knows how to throw big roundhouse punches but has little appreciation for how much he exposes himself when he fails to land them, who doesn't mix in jabs and can't get his gloves back into defensive position. Right now, Speaker Nancy Pelosi and Senate Minority Leader Chuck Schumer, D-N.Y., are pummeling him on policy and baiting him into political mistakes, such as his decision this week to ground Pelosi's military flight to Afghanistan to visit U.S. troops and what Pelosi says was the administration's leaking of her since-scuttled plan to fly commercially into the war zone as an alternative. They've figured out how he fights, and adjusted to it. He's not altering his game at all. "First, they know thin skin when they see it," said former Rep. Steve Israel, D-N.Y., who knows Pelosi and Schumer well. "Second, there is something to be said for having political experience in Washington. You learn not only how to throw punches but how to take them. Trump hasn't figured out either one." Nearly a month into a partial government shutdown that he once bragged he was "proud" to force, Trump still doesn't have funding for the border wall with Mexico at the center of his refusal to re-open federal agencies. Polls have consistently shown that far more Americans blame him for the shutdown than Democrats in Congress. Pelosi's approval ratings are rising, while his are falling. Surprisingly, the trend is reflected among his base voters, according to a Marist/NPR/PBS NewsHour survey released this week which revealed that his approval rating dropped from 73 percent to 66 percent among white evangelicals compared to a December poll. A handful of Republicans in Congress have either voted to re-open federal agencies or voiced support for doing so without the guarantee of money for the wall. But there's been no break in Democrats' unified insistence that Trump approve spending bills before they even entertain a discussion of the wall. Not only is Trump losing the fight over the wall, but he's kept the government closed at the potential expense of the economic growth that has been a regular talking point for him on the campaign trail. Meanwhile, Pelosi and Schumer have found it easy to lay traps for Trump. 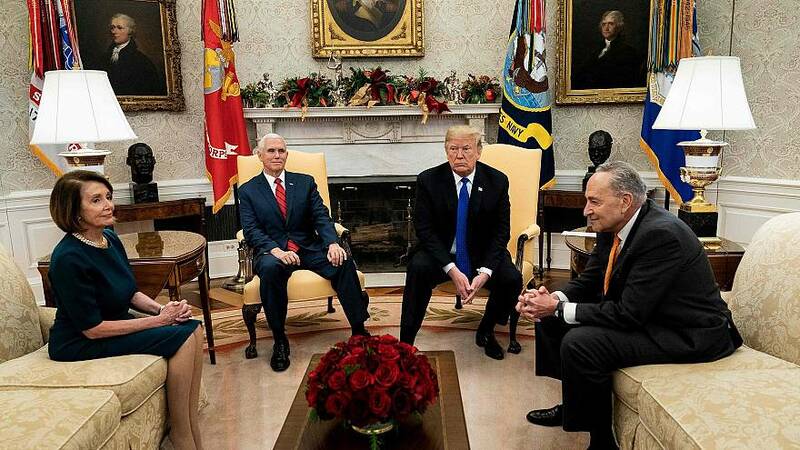 When he invited them to the White House to discuss funding for the government and the wall last month — before Pelosi took the speaker's gavel — Pelosi called the impending breakdown a "Trump shutdown" and Schumer goaded the president until he finally blurted out that he would take responsibility for it. The metaphorical collective head-slap from Republicans on Capitol Hill was almost audible, and Trump has been backing away from that position ever since, even suggesting that the buck stops with "everyone." On Wednesday, Pelosi raised eyebrows when she wrote Trump a letter telling him that he wasn't welcome to deliver the State of the Union if the government is still shut down Jan. 29. She told the former reality TV star turned president that he could submit his thoughts on the state of the nation in writing or postpone the address until the government is fully operational. John Feehery, a GOP strategist and former House leadership aide, said it "wasn't a great move" on Pelosi's part. "I don't think Pelosi is winning either," he said of the current fight over the wall and the shutdown. "I think the media thinks she is winning because the media wants her to win. But shutting the government down was not a major campaign promise and wasn't why the American people voted in a Democratic majority." The State of the Union maneuver looked petty to some observers, but it may have had the desired effect. While White House officials insist Trump's Thursday letter canceling Pelosi's trip to Afghanistan — sent shortly before she was about to depart on the unannounced visit — wasn't retaliatory, it was certainly taken that way by many of Trump's allies and adversaries. Pelosi made plans to take her delegation via commercial plane. But one of her aides said the administration leaked them to reporters, making it too dangerous for her to go. A White House official told NBC News that wasn't the case, but no one at the White House has denied the claim on the record. "For a president to cancel and leak the details of a Speaker's trip to a war zone is beyond reckless. The importance of confidentiality until members and those accompanying safely returned from their mission is paramount," Rep. Susan Davis, R-Calif., a Democratic member of the Armed Services Committee who was planning to accompany Pelosi, said in a statement. "It's appalling that the Commander in Chief who is supposed to protect the American people is the one putting us in danger." Beyond the potential for the muscle-measuring contest with Pelosi to make Trump look smaller rather than bigger, the president's decision on the speaker's flight has serious policy implications. He is a commander-in-chief in the midst of trying todevelop a policy for withdrawing thousands of troops from Afghanistan. She, as speaker of the House, has control of the nation's purse strings — including funding for the war, any withdrawal and the Pentagon and State Department offices that deal with congressional travel. If he doesn't adjust his game plan, it's hard to see how he wins that fight — or any other.